Everyone can swing and slide, but seesawing is the ultimate discipline at the playground, because there are only two options: utter frustration or huge fun! 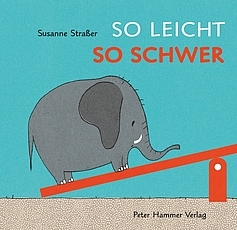 Susanne Straßer puts an elephant onto the seesaw and it is immediately clear that an entire menagerie of lightweights will be needed in order to achieve an up and down movement. There comes penguin already …. This board book comically toys with the infantile experience of light and heavy and shows that many of the lighter variety can even make one of the heaviest move! A wonderfully simple dramaturgy, clear imagery and short, onomatopoetic sentences narrate this little playground story and no one notices that there is a funny physics lesson hidden underneath!